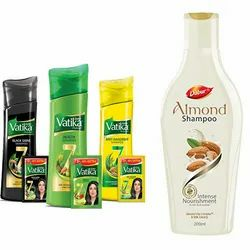 Want gorgeous looking & feeling hair Try Dabur Almond Shampoo. This ultra nourishing shampoo is made using Almond Vita Complex and Milk extracts so that your scalp feels replenished and hair smooth each time you use it. Its regular use will make your hair silky soft and shine beautifully. 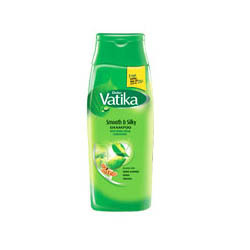 Want to win the battle against damaged hair Try Dabur Vatika Split Treatment Shampoo. Its regular use will not only make your hair feel super smooth to the touch but the lubrication of natural ingredients like Bamboo, Yogurt, Aloe Vera & Walnut extracts will prevent split end causing breakage. Healthy, strong and beautiful hair is now possible! Product Description: Dabur Vatika Dandruff Guard Styling Hair Cream: Enriched with the natural goodness of Lemon, Tea Tree Oil and Almond that help reduce dandruff while being gentle on your hair. Vatika brings to you the wonders of nature, in a bottle!